After the age of 40, most people snore. Yes, men and women! The primary cause of snoring/sleep apnea is the tongue blocking off the back of the throat and airway. 1) A CPAP machine which forces air past the tongue blocking the airway in the back of the throat. 2) A removable dental appliance (Sleep Apnea Device, SAD) worn on the upper and lower teeth, similar to a nightguard, that pulls the lower jaw forward slightly while you are sleeping. The tongue is attached to the lower jaw. When the lower jaw is moved forward slightly while you are sleeping, the tongue moves forward with the lower jaw, away from the back of the throat. The airway is no longer blocked, greatly reducing or eliminating snoring /sleep apnea. The dental sleep apnea device is very effective in almost all cases. Most patients hate the C-pap machine because 1) it is cumbersome, 2) it has a face mask attached to a hose attached to a motor which limits your mobility while sleeping, 3) it makes noise, 4) it can be a problem traveling with the machine on a plane, 5) the sound, hose, etc. can disturb your sleeping partner and 6) few things in life are less romantic than a CPAP machine. The dental SAD is simple and snaps on the upper and lower teeth similar to a nightguard. You place it on your night stand and do not snap it onto your teeth until you turn out the light and are ready to go to sleep. It takes less than 5 seconds to place the dental SAD on the teeth. It is comfortable, does not affect your ability to change position while sleeping, does not affect your sleeping partner at all, is easy to maintain and keep clean and fits in a small box about the size of a doughnut while traveling. You and your sleeping partner will love the dental SAD! Medical insurance generally pays a portion of the cost if you have sleep apnea. 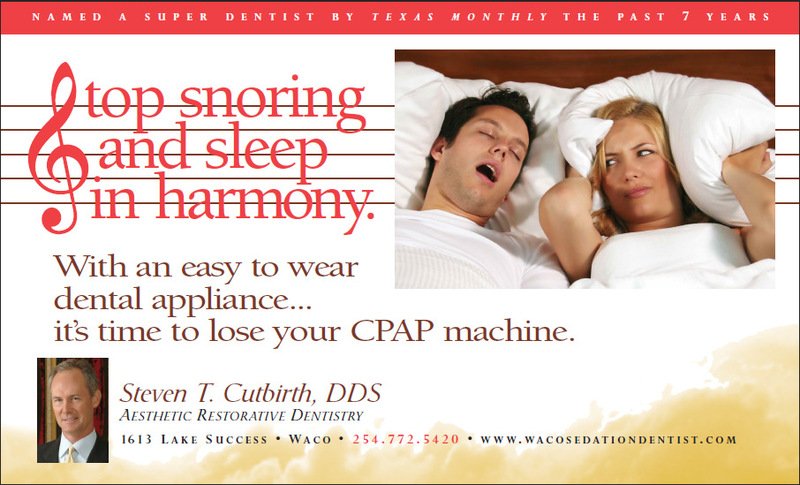 Call our office for more information on the SomnoMed sleep apnea appliance. Yellow teeth, crooked teeth, worn teeth, short/small teeth? Consider Porcelain Veneers! I would most definitely recommend Dr. Cutbirth to anyone. The professionalism and care that not only he, but his entire staff have, is phenomenal. No hassles at all. He also has what I like to call the “magic touch.” Never have I had so little discomfort at a dentist. Even the injections didn’t hurt! This guy really knows his business. 5 stars! Dental procedures used to scare the living daylights out of me. I’ve cried a few times while having my teeth worked on, and it’s embarrassing! A friend told me about Dr. Cutbirth and how I should give him a try. I reluctantly went and I am SOOOOOOO glad I did! He handled my cavities and I honestly didn’t feel anything. He explained everything each step of the way and I was calm the whole time. Great experience! I’ll admit that I’m not the most careful person when it comes to oral hygiene, but I do brush and use mouthwash regularly, so I was surprised when I found out I had 3 cavities…I got ready to hear a “sales pitch” about all the different dental treatments I was going to need and how much it was going to cost… But that’s not the kind of dentist that Dr. Cutbirth is. He really wants to help his patients take care of their teeth. Dr. Cutbirth is by far the best dentist I have ever visited. Somehow he manages to do his work without causing any discomfort to the patient. He and his staff are very friendly and I feel very “at home” in his office. The work he does is great too! I am very pleased with my experience with him. My husband has never really been a person to go to the dentist. He had a bad experience when he was young and never went back. I expected him to come back complaining about the visit and saying that he would never go again. Quite the opposite. He was telling me how I was right, and how it wasn’t bad at all. Thank-you Dr. Cutbirth for giving him such great care! To anyone afraid of visiting a dentist: Go see Dr. Cutbirth! I was scared of the dentist too. Scared of the pain and discomfort usually involved with dental procedures. Dr. Cutbirth worked on my teeth and I never felt a thing! He even did my root canal! He is like a dental magician because I don’t know how he does it. I’ve always been embarrassed by my smile. My parents didn’t have a lot of money when I was growing up, so dental care was not on their priority list. I went to see Dr. Cutbirth and was expecting to be told that it would take years to fix my teeth and that it would also be very painful. Not at all. Dr. Cutbirth patiently went over with me all the points that needed to be addressed and gave me an accurate estimation of how long it would take to handle. Finding a good dentist is like finding a good mechanic. Once you have one, stick with him! Dr. Cutbirth is that dentist. Very professional staff, friendly service, expert care. I wouldn’t go to or recommend anyone else. I am very satisfied with my service. I would send anyone afraid of going to the dentist to him as he has the lightest touch I’ve ever experienced in dentistry. Call 254-772-5420 today to schedule. Waco dentist Steven T. Cutbirth DDS has built his practice around comprehensive dentistry. This includes exceptional restorative and cosmetic dentistry, TMJ treatment, sleep apnea treatment and general dentistry. He even offers sedation dentistry options such as conscious sedation and IV sedation to patients who prefer it. His patients come from all around the Waco, Texas area including the communities of Woodway, Hewitt, Robinson and China Spring, TX and zip codes 76708, 76710, and 76712.